Say hello to sparkling clean cans. Clean trash bins are just a few clicks away. Dirty garbage bins can be dangerous! Did you know that dirty garbage cans aren't just a smelly nuisance around your home, but also carry potentially harmful bacteria and viruses? They can also attract pests and rodents! 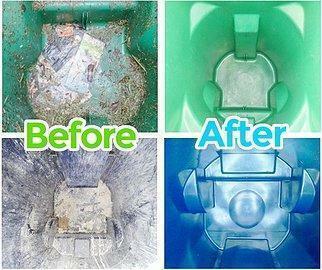 Our curbside trash bin cleaning service leaves your bins sparkling clean and smelling great. Sign up in less than 60 seconds. Pay a flat monthly subscription each month. Cancel at any time. 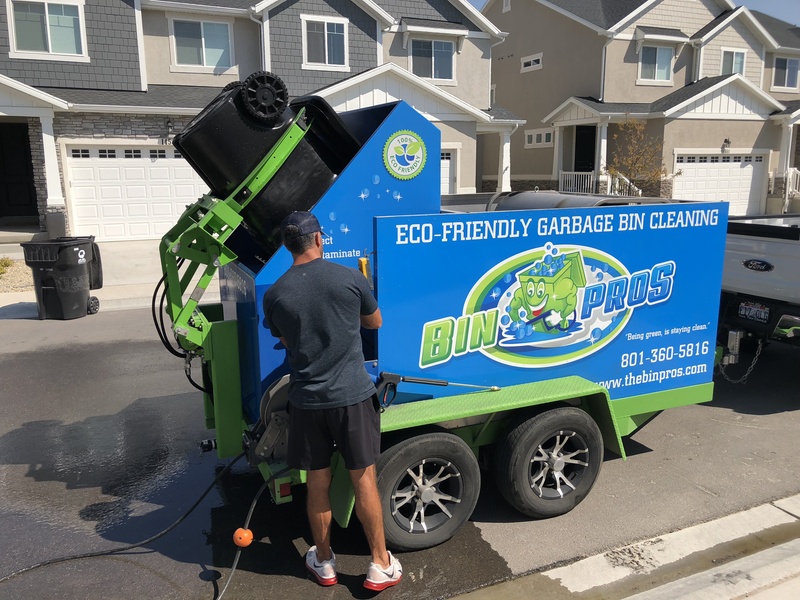 Once a month, we'll stop by after the garbage man has emptied your cans and spray them with our high-pressure, high-temperature bin cleaning machines. No more holding your breath every time you open up your garbage cans. They'll not only be decontaminated, but we'll deordorize them as well. Hooray! Each additional can only $5. A service built for you. We'll stop by once a month just after your garbage cans have been emptied - all automated, no headaches! All of our methods and cleaning products are environmentally friendly. We'll notify you when we're scheduled to clean your cans and send you a text when we're done! Our sign-up process is a breeze. Takes less than 60 seconds! Our subscriptions are all monthly. Cancel at any time, or take us with you when you move. We kill 99% of all known germs, fungi, viruses and other microorganisms. "This service is awesome! The people at BinPros detailed and removed the smell that was lingering even after we tried to clean them ourselves... We highly recommend!" "They cleaned our cans this past week. They really clean them well. Inside and out they spent more time than I expected making sure they were spotless. They can't do anything about wear and tear on the cans, but they are VERY clean." "They have come out to us and did a great job. Very happy we saw the ad and signed up...So worth it." Why do my cans need to be cleaned? Most people know their garbage cans are dirty, but they don't understand the dangers of long-term build up of microorganisms, viruses and harmful bacteria that happens over time. Some of these can include; Strep, E-coli, Salmonella, Listeria and Tuberculosis! Despite this, most people don't have time or the proper tools to adequately clean their bins. This can also attract pests and rodents to scavenge your garbage cans. We recommend cleaning your cans once at least once a month. How do you clean the cans? We use state of the art technology and lift each can into our pressure washing system, which utilizes high-temperature, high-pressure soakers that rotate 360 degrees and cleanse your cans for 30-45 seconds each. Additionally, we spray the outsides of each can and deodorize them with special air fresheners. When will you clean my trash bins? We know the garbage routes in each city and come on the same day your garbage cans have been emptied by the utility services company. This way, your cans are empty and ready to be cleaned already. Before we come out, you'll receive a notification as a reminder to keep your bins empty. How will I know my bins are clean? After your monthly service, our technicians will send you a notification after they have decontaminated and sanitized your cans, letting you know they are ready to go back inside your garage or into their normal spot. My bin wasn't cleaned when it was scheduled? - You didn't take your cans out to the street for us to clean them. If any of the above occured, or for any other reason, you can call us to reschedule your cleaning for that month and we'll do our best to notify you if we weren't able to clean your cans. Yes, we carry a full auto and business insurance policy. We are fulled licensed by the state of Utah and we follow all city and state regulations in regards to water dumping. Can you work with HOAs? Absolutely! Due to the high demand for our services, it often makes sense for our bin cleaning to be included in your neighborhood's HOA program. Please visit our HOA page for more details. My bin wasn't spotless after my service, how come? On very rare occasions, some cans are EXTREMELY dirty. It can take a few cleanings to fully remove the built up grime from these cans that haven't been cleaned in several years. However, this is a very rare case and is usually fixed after 2-3 cleanings. Please note that some stains, such as paint or dried tar cannot be removed completely by our cleaning services. We keep things simple and easy. We charge $13.99 per month and just $5 per additional can after the first. Each month you are billed automatically, using the billing method of your choosing. We occasionally offer seasonal promotions and discounts. Be sure to ask our team if any are available. If you already have a discount code, you can use it at checkout on our booking page. You can call us to cancel your subscription at any time by calling our team at 801-360-5816. Nope! You can cancel your service at any time. If you move, we can move with you. Can I change my billing method? Absolutely! Just give us a call and our team can help you out. Can I gift a cleaning to a friend or neighbor? Yes! We love to encourage the gift of clean garbage cans! As long as the recipient is within our cleaning routes, we are happy to help you spread the love. Please contact us with the address of the cleaning and we can add their services to your existing account for billing. If you want to simply gift a one-time cleaning, we can accommodate that as well. Should the recipient sign up for recurring cleanings, you get a free month of services on us!